Leadership was in focus during a recent Hannibal Central School District Board of Education meeting, as Dennis M. Kenney student leaders thanked school board representatives for their service and commitment to the district. In celebration of Board of Education Appreciation Month, members of the newly established Kenney Leadership Team presented board members with handmade paperweights. 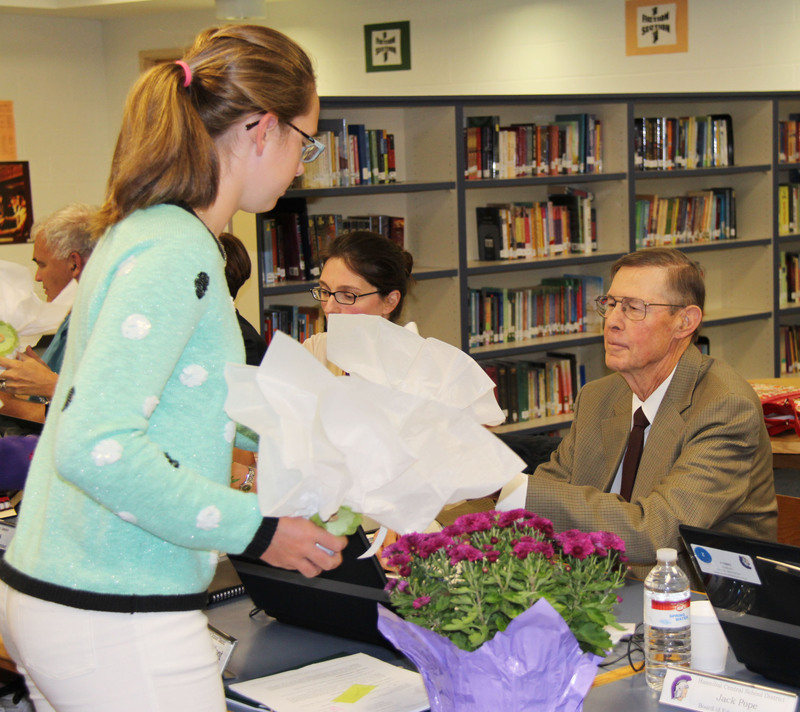 Rebecca Marsh, a member of Dennis M. Kenney’s student leadership team, presents Hannibal Central School District Board of Education member Dale Young with a paperweight as a sign of gratitude during Board of Education Appreciation Month. “This is a token of our appreciation, from one leadership group to the next,” said KLT member Velvet Howland as the paperweights were distributed. Howland and nearly two dozen of her middle school peers are part of the KLT, which aims to facilitate leadership qualities, promote a positive school environment and develop a cohesive student body. According to school counselor Meg Jaworski, who oversees the KLT, group members have already taken on significant projects to display their leadership skills. While the group has already tackled several major projects, the KLT is also eyeing a reading partnership between DMK and Fairley Elementary School. Additionally, the group will begin a mentoring program with fifth-graders in hopes of building upon the relationships created during orientation.